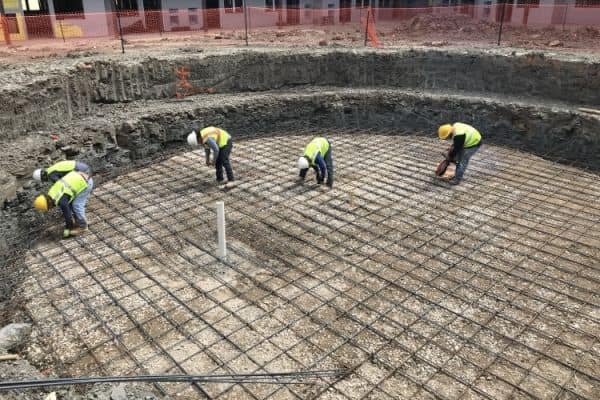 This custom swimming pool is going to be an 18′ circle with a depth of 6′ 6″ at the deepest point. To frame our swimming pool, we are pouring a 2′ beam all around the edges of our circle. A beam is a thicker layer of concrete that “frames” our swimming pool and creates a stronger barrier against soil movement. Our soil injection – detailed in our last post about our Texican pool progress – worked to stabilize the soil. As a quick recap, we contracted soil engineers who determined that we needed to inject the soil with an ionic solution that would reduce the clay’s natural affinity for water. The clay soil in Texas tends to expand and contract during periods of heavy rain and drought. This can cause commercial pools to crack, and we make sure to prevent this from happening. Because our concrete slab has an overall thickness of 12″, we actually laid 2 layers of steel. This image shows our crews pouring the base. 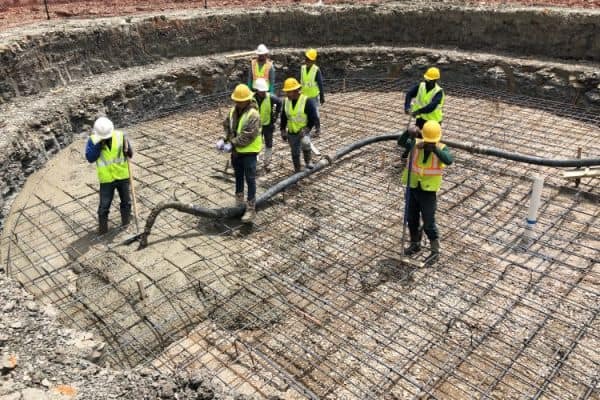 Our next step is to lay steel rebar – sometimes referred to as “tying steel.” For this project, we are using 1/2″ rebar in 12″ grids for a concrete base with a depth of 12″ which will make the swimming pool incredibly stable. Our purpose for laying this 12″ slab of concrete is to completely isolate the base of our swimming pool from the soil beneath it. Although our chemical injection should neutralize the impact of water on our soil (as far down at 15′), this slab will help neutralize any potential for ground movement. After the concrete pool base has been poured, we continue with the framing process. To do this, we have sourced a company that produces pre-cast Geo Foam – (similar to the material we used on the Khaldoun job). This foam serves to create a high-density barrier between the soil and the shell of the swimming pool. Summerhill Pools has a long history of building strong and reliable swimming pools for both residential and commercial customers in the Dallas/Fort Worth area. We love working closely with our customers and would gladly visit your home or commercial facility to provide you with a free estimate. We can even create a 3D rendering of your pool design with your backyard or commercial facility factored in. We invite you to contact us if you have any questions or interest in a pool for your home or commercial facility.